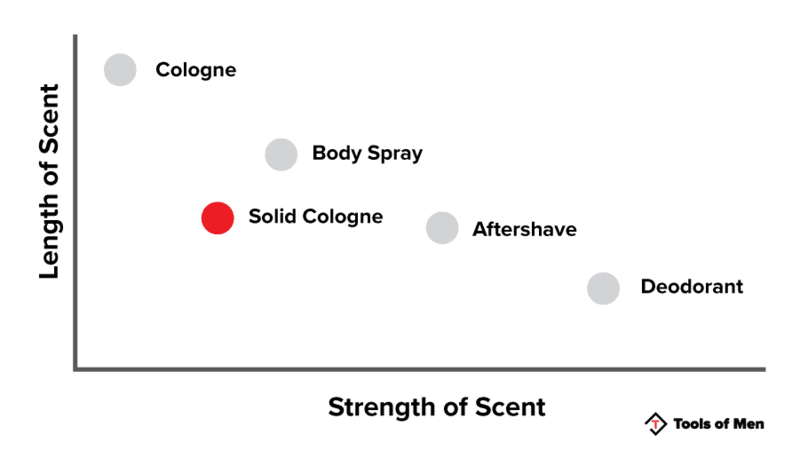 Strength Of Scent Compared To Other Colognes, Body Sprays, Aftershaves, Etc. A classic cologne can be great, right? Or worse, when you are getting ready to board a flight and the lovely TSA agent named Thad just swiped your favorite bottle because it didn’t adhere to the 3.0oz threshold. All of those problems disappear when you use some of the best solid colognes on the market. There was a reasons that the Egyptians loved this stuff thousands of years ago – it’s discrete and effective. From rich manly scents like leather and tobacco to those that are both refreshing and light, we compared and outlined some of the best solid colognes that you can buy with only a few clicks. 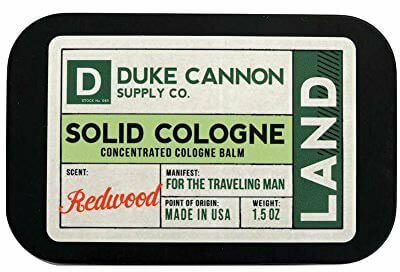 Nothing says “extra manly” like Duke Cannon’s “Redwood” scented solid cologne. This fragrance is all about strength and raw power; invigorating scents of sandalwood and clove create the ultimate musk that is easily spread with just your fingers. Along with “Redwood”, Duke Cannon has also released the scents “Open Skies” and “Naval Supremacy”, all of which harness the sheer forces of nature and compact them into a tight wax slab that you can then use at your leisure. “Redwood” in particular captures the balance between delicate fragrance and aggressive musk, resulting in a pleasurable twist of the two. The cologne is delightfully robust, and the sandalwood is a perfect pairing to the citrus and clove. It is all around a wonderful, long lasting scent that is sure to please everyone around you. This cologne is made with certified organic ingredients, pulled right from nature and then infused into the wax for a well-rounded experience right on your skin. Coconut and sunflower oil are added to the beeswax to hold the fragrance, plus both oils are used in skin care products. Orange and clove bud essential oils are added to create a complementary scent of citrus and musk, leaving you smelling like a fresh forest. This cologne sports a label that looks like it came from the ‘50s for that nostalgic look, and is all-American. The product is made in America for hard-working men who want a fragrance that works as hard as you do. Plus, when you purchase a Duke Cannon Solid Cologne, a portion of the proceeds go to benefit U.S. veterans. Do some good while smelling good at the same time! A solid cologne that lasts all day is hard to come by, but Inis’ Energy of the Sea does just that. It comes in a sophisticated small glass cube that looks great. The product is made in Ireland, and utilizes fresh ingredients from the land of the lucky. While the size is much smaller than other commercially available colognes, you do not need a lot to last you through the entire day. The highly concentrated solution only requires a small dab on your wrists, neck or pressure points to pull you through a whole workday. Energy of the Sea uses all natural ingredients from Ireland, and is never tested on animals. The result is an extremely concentrated solid cologne that works as hard as you do, but keeps you fresh throughout the day. The only drawback to this product is that it is a minuscule 0.17 fluid ounces, compared to many other solid colognes that clock in at 0.5 to 1 oz. Despite this, Inis has created a high quality product that is long lasting and cruelty free. Men and women alike can enjoy the clean notes the ingredients offer this neat little package. If you are looking for a fresh scent reminiscent of an Irish spring, Ireland Tweed is exactly that. 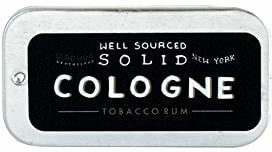 This cologne from The Beer Soap Company is a mix of incredible ingredients with a whole lot of staying power. Unlike other competitors, the wax used as the base is candelilla wax, not beeswax, so it is a little harder than most, but still easily spreadable. It is also a completely vegan product, using ingredients such as sandalwood, oakmoss, and ambergris. Lemon verbena scent is added to help round out the scent profile, but also acts as a re-energizer for long days at the office. The tin contains 1 oz. of product, and is lightweight and easy to carry wherever you need to freshen up. Which should not be too often, as the fragrance is observed to last for a few hours. Great for wearing through the morning as a rejuvenator. 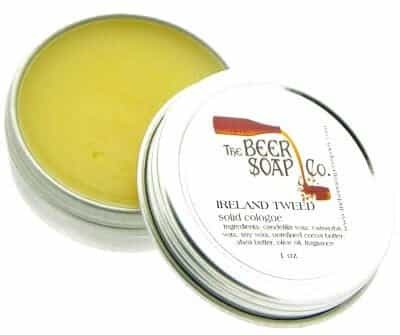 The fresh, zesty scent of Ireland Tweed is a must have if you are looking for a refreshing cologne that is not too powerful on the nostrils, but still adds to your day to day routine. NZ Fusion Solid Cologne mixes the best sea and land down under. 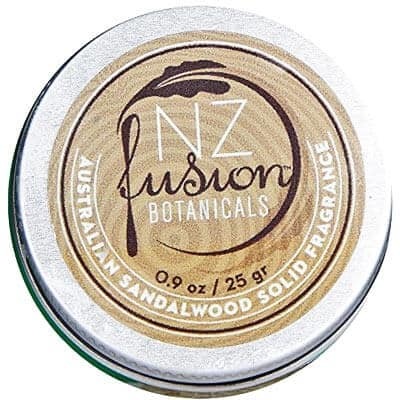 Fusion adds real sandalwood harvested from Western Australia as a unique twist to their cologne, making it different from those that simply use essential oil. The resulting mixture is a warm, buttery scent that is equal parts delicate and suggestive. The base of this fragrance is centered around a woody aroma, like a sawmill that churns out pure masculinity. While this cologne is not as aggressive as others, it is a scent that prefers to be discovered, rather than announced. This fragrance has over eight hours of lasting power with just one application, so it’s perfect for all day wear with just a little dab of fragrance. 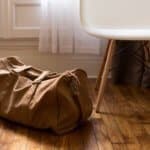 The wood tones carry well throughout the air, but it’s not an overpowering scent – it is akin to passing by a pile of fresh wood shavings on a summer day. Sandalwood can come across as a very overpowering scent, and care should be taken when applying this product so as to not overwhelm your own natural flavor. When care is taken, Fusion is a very pleasant with a whole lot of staying power. The one thing to remember with this product is you don’t want to use too much. 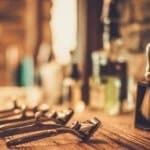 Too much wax in one application can leave you smelling like a sawmill, and that can be overpowering. Glide your fingers over the tin to pick up a small amount of the fragrance, then apply where you normally would put cologne; ears, neck, wrists, wherever. Easy to apply, easy to wear, and for a price that is virtually unbeatable, NZ Fusion gives you the best value cologne for your money. For men who desire a milder scent, O’Douds Solid Cologne is perfect for everyday wear. This product comes in two distinct scents: Tobacco Rum and Heritage. For a deeper and more robust scent, Tobacco Rum has you covered. It is the more adventurous fragrance of the two, featuring an earthy and robust mixture offset by the spicy hints of aged rum. The scent is subtle, but strong enough to last for hours. Heritage, on the other hand, harmonizes citrus and sandalwood perfectly for a sweeter scent. It is a prime candidate for individuals who prefer a more traditional take on cologne. The suggestion of fruit in Heritage’s mixture does not compromise your masculinity, and instead offers a lighter scent that is pleasant in close encounters. Both concoctions are hand crafted and mixed with natural ingredients, which puts a little personality in every tin. The Tobacco Rum cologne contains essential oils such as sandalwood and cedar that are pleasant to the senses. There is nothing overpowering about this fragrance, and serves as an accent for day to day wear. However, Heritage’s citrus scent may come off as unappealing to some due to the fruity overtones within the cologne. Both products are expected to last between 5 and 7 hours, more than enough time to get through the average workday. The tin is very small – roughly 2 inches long and 1.4 inches wide, which enables it to fit easily in the pocket of a suit or pair of jeans. Easily accessible, easy to store, no chance of leaks or spills due to the beeswax base. Perfect for travel or on the go, O’Douds Solid Cologne is there when you need it, wherever you are. The scent of a spruce forest on a summer’s day is an interesting play with deep and rich earthy tones and the high citrusy spices that dance in the wind. Spruce Solid Cologne by Otter Wax is exactly this scent and a little more, contained in a convenient tin. The cologne uses the essential oil from Douglas Fir and cedar wood trees as its base, and then adds orange and bergamot essential oils to draw out the woody tones of the wax and provide a unique balance to the fragrance’s palette. 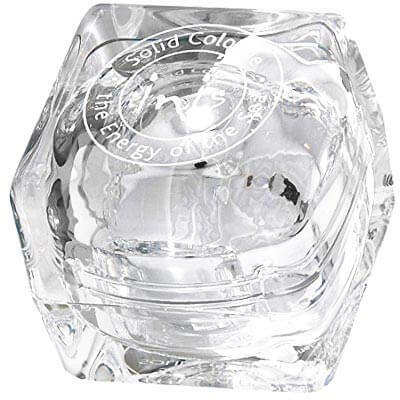 What Spruce Solid Cologne does differently than other products is it features a slow fragrance release. Other colognes are strong at the start, and then fade out to a barely noticeable scent. Spruce Cologne does the opposite; it begins as a faint, barely-there fragrance and evolves into a pleasant aroma that hangs around for a few hours. Otter Wax is driven to quality standards and all natural ingredients, which is why you won’t see animal fats of fillers in any of their products. Spruce Cologne is a perfect testament to that, and the rich scent within the tin is powerful enough to complement any man. A stiff drink has been known to give a man confidence to do pretty much anything, and that confidence is perfectly captured within Bay Rum, a cologne by Stingray Bay. This cologne is reminiscent of spiced rum that’s been perfectly aged in a barrel, and it transfers perfectly to where you need it. The invigorating fragrance is pleasant to the senses, with notes of lemon, patchouli and cloves for a citrusy twist. The ingredients are 100% natural, and the star of the show is certainly the warm rum scent that lingers after you’ve put this cologne on. This fragrance is not overwhelmingly musky, instead preferring to go for a spicier approach that makes this scent hard to ignore. Great for all day wear in the office or just occasionally for dinner. 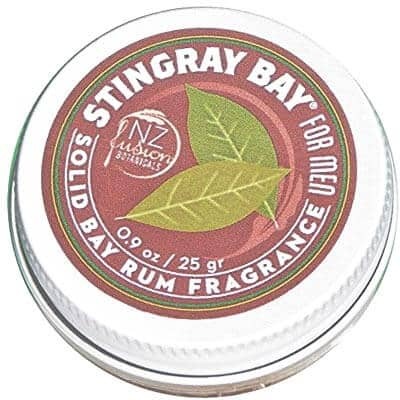 Stingray Bay Solid Cologne will last for 2-4 hours, depending on where you are and how much you apply. Since they have changed from a plastic cup to a solid tin, it’s even easier to carry around with you wherever you go. Now you can quickly freshen up in the bathroom, in your cubicle, or even on the street. Plus, this fragrance is incredibly affordable so you get more bang for your buck. If you want to smell great and feel like a million dollars, the Stingray Bay solid cologne is a great choice for new and veteran cologne users. With soft, malleable wax that goes on smooth and lasts for hours, and a Bay Rum scent that people will find irresistible, this solid cologne is sure to have you coming back for more. 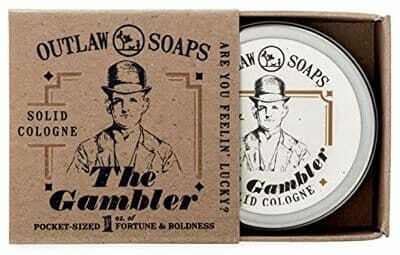 “The Gambler” Solid Cologne by Outlaw Soaps is exactly like Kenny Rogers sang it in 1979. It is that last drop of whiskey on a train bound for nowhere, musty back rooms with cigarette smoke lingering in the back. This is the kind of cologne that will put hair on your chest and back. It smells like soft leather, hard work, and the hint of tobacco to create the ultimate manly experience. It goes on extremely smooth and lasts for hours, leaving you with an irresistible scent for every occasion. The Gambler is a solid cologne, meaning it’s going to go exactly where you put it, unlike sprays that have the tendency to go everywhere. The cologne comes in an easy to carry tin, with a simply twist off lid for touch-ups on the go. Additionally, the one ounce tin can be carried discreetly within a coat pocket. The saying “a little goes a long way” applies to this product; a small amount will last you through dinner, but you may want to dab on a little extra for afterwards. For those folks with sensitive skin, this is a fantastic product for you. It is made with natural ingredients like beeswax and cocoa butter which aids in keeping your skin soft and supple, and the addition of essential Vitamins A and E help maintain a healthy skin. What’s great about this product is that the traditional burn is absent in this solid cologne, unlike liquid fragrances where the burn is very noticeable. There are also very few downsides; the scent may appear to dissipate faster than other liquid fragrances, due to the how the product is applied. Despite this, “The Gambler” Solid Cologne is still a great choice for men (or women) who want to feel like they wrestle bears and hunt sharks in their spare time. Ulio&jack have come out with a solid cologne that is as rugged as you are. “Drifter” is a well-balanced scent that is reminiscent of a lone motorcycle ride under the moonlight. This men’s fragrance is laced with sweet notes over spicy undertones, with hints of mandarin, cardamom, sandalwood, and clove. There is also a hint of leather in the mix to draw out the masculinity within the wax. Applying the cologne is simple, and you don’t need to use a lot to get the results you want. The small, easy to carry tin is perfect to stash in your jeans’ pocket. With its size, it can easily be carried onto airplanes without hassle, and is not likely to melt if kept in your pocket. It is no bigger than a tin of mints, but “Drifter” is much less palatable. This cologne packs a lot of punch in a small package, and should last for several months depending on how often it is used. Besides a beeswax base, this product features shea butter – an additive that also acts as a moisturizer and natural sunblock. The combined effects of jojoba oil ensure that the beeswax stands up to hotter temperatures, such as pockets, bags, and occasionally glove compartments. The lasting power of the fragrance is between 2 – 4 hours, so it’ll definitely get you through any company dinner party. However, if you are looking for a strong scent, this is not it. The smell is there, but it’s more like a suggestion than a statement. 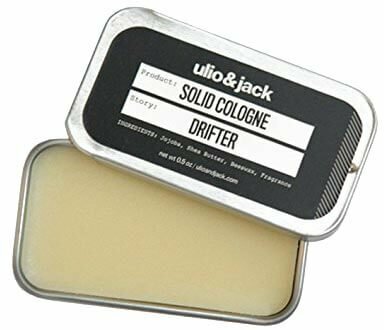 “Drifter” is best used to enhance your natural clean scent, boosting your appeal in a subtle way. A cologne should be discovered, not announced. 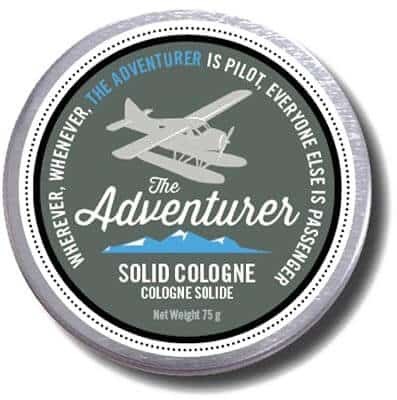 This is a philosophy held by the folks over at Walton Wood Farm when they released their “Adventurer” solid cologne. It is lovingly handcrafted with all natural ingredients for a subtle suggestion on your body. Many colognes these days want to make a bold statement, and overcompensate with saturated scents and overwhelming fragrances. You are a man of class and statue, who prefers a cologne that whispers in the ears of those around you. This is a cologne that speaks without speaking. It is an exceptionally subtle fragrance, and as such may not be very noticeable. It has a lasting power of about 2 -3 hours, depending on how much is applied. This is due to the fact that Walton Wood Farm products use 100% natural, farm grown ingredients instead of concentrated oils and manufactured scents. Organic ingredients such as grape seed oil, jojoba oil, hemp seed oil, and shea butter are all added into the natural beeswax base to create a unique and pleasurable scent that is as subtle as it is enjoyable. Vitamin E is also added for additional skin softening goodness. Men love solid colognes for a variety of reasons, but their compact size alone will be among the most favorable aspect of this product. 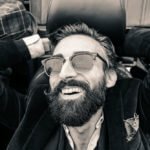 Typically packed in a tin that is no larger than an ounce or two, a solid cologne can fit easily away in your favorite dopp kit or weekender bag. 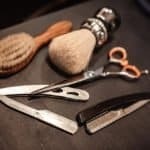 Therefore, their portability is great for the men who find themselves always on the road and completely loathe the TSA every time they snag your favorite grooming gear. Another cool little feature of the small size is that it’s perfect for when you may need to randomly freshen up during the day. So if you just hit the cardio hard at your local gym but didn’t have your favorite body spray or a few minutes extra to shower, applying a solid cologne is a great and subtle way to mask any sort of body odor. Like any cologne, manufacturers make these products in a variety of scents. However, one notable difference between a solid cologne and the traditional cologne is the composition of the product itself. More often than not, solid colognes are created through the use of natural ingredients (but not always). These natural ingredients that manufacturers rely on in order to achieve that desired scent is largely derived from essential oils. 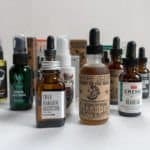 Essential oils are finding their way in to a plethora of both men’s and women’s beauty products alike including beard oils, beard balms, shaving creams, shaving soaps, shampoos, and more – and with good reason. You see, essential oils beyond just delivering any scent imaginable, also provides a lot of homeopathic remedies. For instance, did you know that tea tree oil is a natural antiseptic that is extremely effective at warding off acne? While the natural remedies may go beyond the scope of this article, if you are interested in learning more – a quick Google search should provide a plethora of information about each oil. Now when it comes to the scents of essential oils, there are a ton to choose from. Therefore, just like a standard cologne, developing a fragrance is more of an art form rather than exact science. In addition, how one fragrance may interact with your body and the climate you are in (i.e. humid vs. dry) may be completely different from another man. One last key distinction about essential oils is their staying power. Unlike a synthetic fragrance that is found within virtually all standard colognes that is built to last for hours on end, essential oils will typically remain noticeable for only a few hours. Therefore regular application in the midday or evening hours may be necessary depending on your personal scent preference. When it comes to the wide array of scented products for men, you will see a large degree of varying scents and their strengths. While not to be taken as an exact rule, solid colognes generally tend to be slightly more aromatic than a body spray while also having a relatively lower duration of scent (largely due to the inclusion of essential oils over synthetic fragrances). 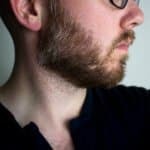 Should a solid cologne contain a synthetic fragrance, then it will likely have an equal or longer duration of scent when compared to a body spray. Going out for the night or simply just hitting the gym? Then you will want to take notice of the type of scent that each one of the solid colognes listed here provide. 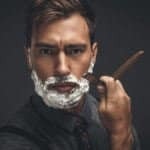 Generally, a rule of thumb that most men follow (and we suggest the same), is that spicy and heavier scents will pair well with evening activities. So if you plan on going to a bar, dancing, concert, or simply a nice dinner, then a scent with deep base notes will be key. Contrary, if you are taking a midday workout or just hopped out of the shower in the morning and are heading to work, clean and brisk fragrances will carry themselves lightly and will be appeasing to both your nose and those around you. Therefore, when picking up a solid cologne, we would recommend getting one for both occasions so you will be well prepared. When you finally get your brand new solid cologne in the mail, the application process may throw a few men off. Apply it to your wrist.